AMSTERDAM, The Netherlands, August 22, 2013 (ENS) – The Russian government has denied permission for the Greenpeace ship Arctic Sunrise to access the busy Northern Sea Route, although Greenpeace International says its icebreaker has fulfilled all requirements for entry. 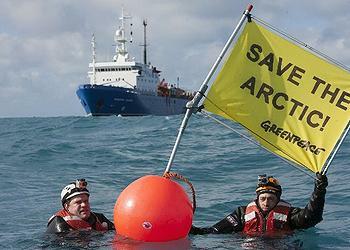 “The refusal is in violation of international law including the right to freedom of navigation,” Greenpeace said. The Arctic Sunrise is on a month-long expedition to expose and protest oil exploration in the Arctic, which Greenpeace says is environmentally risky. Greenpeace claims the decision is an attempt to prevent it from exposing the activities of Russian state-owned oil company Rosneft. Multiple vessels contracted by Rosneft and U.S. partner ExxonMobil have been conducting seismic testing and geological work in the Kara Sea in preparation for offshore Arctic drilling. “This is a thinly veiled attempt to stifle peaceful protest and keep international attention away from Arctic oil exploration in Russia,” said Christy Ferguson of Canada, Greenpeace Arctic Campaigner aboard the Arctic Sunrise. “The Arctic Sunrise is a fully equipped icebreaker with significant experience of operating in these conditions, while the oil companies operating here are taking unprecedented risks in an area teeming with polar bears, whales, and other Arctic wildlife,” Ferguson said. Present in the adjacent Barents Sea region is a polar bear population that is genetically distinct from other polar bears. None of the six oil exploration vessels operating for Rosneft and ExxonMobil in the area has an ice classification as high as the Arctic Sunrise, Greenpeace said in a statement Wednesday. More than 400 vessels have been granted access to the Northern Sea Route this year, many of them with an inferior classification to that of the Arctic Sunrise, which is classed as an icebreaker. Greenpeace International entered three detailed applications for entry to the Northern Sea Route Administration, stating its intentions to engage in peaceful and lawful protest. All applications were rejected. The first two applications were rejected on the basis that it was not clear what level of ice strengthening the vessel has, despite Greenpeace’s presentation of a Classification Certificate from Det Norske Veritas, an internationally recognized classification society, confirming that the Arctic Sunrise is classed as an 1A1 ICEBREAKER. This classification is the second highest notation available at the time of the ship’s construction and a notation superior to Arc6 in the Russian system, Greenpeace says. The latest application was refused on the grounds that the information provided on the ice strengthening of the ship’s hull was apparently insufficient. This issue was not raised at the time of refusal of the first two applications. 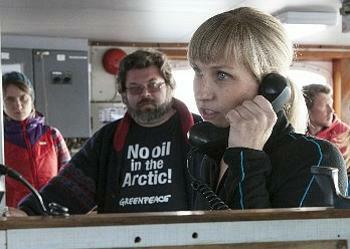 In addition, Greenpeace notes that the area the Arctic Sunrise was bound for is free of ice at this time of year. “From the pattern of refusals it is clear that the Northern Sea Route administration has never been interested in granting Greenpeace access,” the group said. Greenpeace International has written to the head of the Northern Sea Route Administration with an urgent request to reverse the decision. As the Arctic Sunrise is a Dutch flagged-vessel, a copy of the letter has also been sent to the Dutch Infrastructure and Foreign Ministries. Nevertheless, Greenpeace confronted the Rosneft-contracted Akademic Lazarev seismic vessel in the Barents Sea north of Russia. As the ship began firing underwater sound cannons up to 250 decibels in the Fedynskiy license block, Greenpeace approached the vessel, demanding that it stop operations immediately. Ferguson requested permission to come onboard “to discuss safety measures taken to ensure no wildlife is harmed during seismic testing.” She was not invited to board the Russian vessel. Rosneft says its Kara-Summer 2013 scientific expedition to collect data in support of exploratory oil drilling completed its voyage on August 16 after 30 days at sea. “Given the low exploration maturity of the Kara Sea, Rosneft in cooperation with ExxonMobil gave the green light to a series of large-scale, scientific and research programs in the Kara Sea to precede 2014 exploration,” the publicly traded oil and gas company said in a statement Monday. The Norwegian company Statoil and the Italian oil and gas company Eni also have joined Rosneft in the Arctic oilfield development. Scientists aboard the the Arctic and Antarctic Research Institute’s survey vessel Akademik Fyodorov collected data on waves, currents, sea level fluctuation, wind velocity, temperature and water salinity variability, dangerous ice bodies, ice drift and strength properties, and iceberg build-up and spread rate. Rosneft said the scientists investigated “an extremely dangerous natural phenomenon,” the Novaya Zemlya Bora, a high velocity wind that blows from the mountainous coast of Novaya Zemlya, the archipelago that separates the Barents Sea from the Kara Sea. The information gathered will be used in support of exploratory drilling in the Kara Sea’s Vostochno-Prinovozemelsky-1 license block priority areas. The scientists collected “met-ocean and ice data for conceptual design of year-round oil and gas production facilities in each of the three Vostochno-Prinovozemelsky license blocks, primarily of gravity-based platforms, export terminals and subsea production facilities.” Rosneft disclosed. On the east coast of Novaya Zemlya where no routine weather observations have been conducted since the 1990s, Rosneft and the Arctic and Antarctic Research Institute installed three self-contained weather stations transmitting data on weather conditions in the West Arctic region. Kara-Summer 2013 is the third expedition commissioned by Rosneft. In August, Rosneft used 12 vessels, three aircraft, air drones, submersibles, subsea and floating self-contained stations, satellite surveillance systems and other equipment for the Kara Sea studies. In 2013, Rosneft’s total investments in the Kara Sea studies will exceed 1.5 billion rubles (US$45.4 million). Novaya Zemlya was a sensitive military area during the Cold War years and is still used today. Beginning in 1954, Novaya Zemlya was used by Russia as a test area for nuclear weapons, which were exploded in the atmosphere, underground, and underwater. Between 1955 and 1990, the site was used for approximately 130 tests, including the October 1961 detonation of the largest nuclear weapon ever tested, the 50MT AN602 Tsar Bomba hydrogen bomb.